Updated: Uber has now decided to suspend its self-driving car fleet while it investigates the crash we reported on yesterday, which left one of its vehicles lying on to one side. According to Uber there were no backseat passengers on board at the time of the crash, just two engineers riding in the front, and it's not clear whether the car was actually in self-driving mode at the time. One day in the not-too-distant future, self-driving car crashes won't be particularly newsworthy, but while the tech is still being developed there's a lot of attention on any potential problems - and Uber just came across another one in Arizona. According to photos shared on Twitter and confirmed as genuine to Bloomberg, one of Uber's test vehicles was left on its side after an accident. At least two cars driven by normal human beings also seem to be involved, but as yet the details of the smash are sparse. We don't know yet whether the incident was caused by the self-driving car or someone else, or whether there were any injuries - though none have been reported so far. As more details emerge about the crash we'll add them in here. 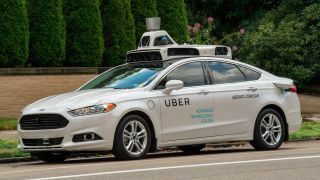 It hasn't been the easiest few months for Uber, with numerous problems stacking up at the corporate level and legal issues slowing down the testing of its autonomous vehicle technology in California. The firm will be hoping the fallout from this latest smash blows over pretty quickly. Meanwhile, Waymo - the company born out of Google's self-driving car project - continues to publish monthly reports on all the bumps and smashes its own autonomous motors are involved in. So far they have mostly been caused by errors on the part of human drivers, and none of Waymo's cars have yet ended up on their side. Some of Tesla's self-driving technology is of course available now in certain models, and has already been credited with avoiding a few smashes. Drivers and regulators alike are going to be keeping a close watch on developments as these self-driving technologies are improved and refined, and there's bound to be another crash or two along the way.